Ask-Socrates is an innovative, Software-as-a-Service platform offering unique perspective and tools intended to help individuals and organizations better research and interpret the global economic and political environment. 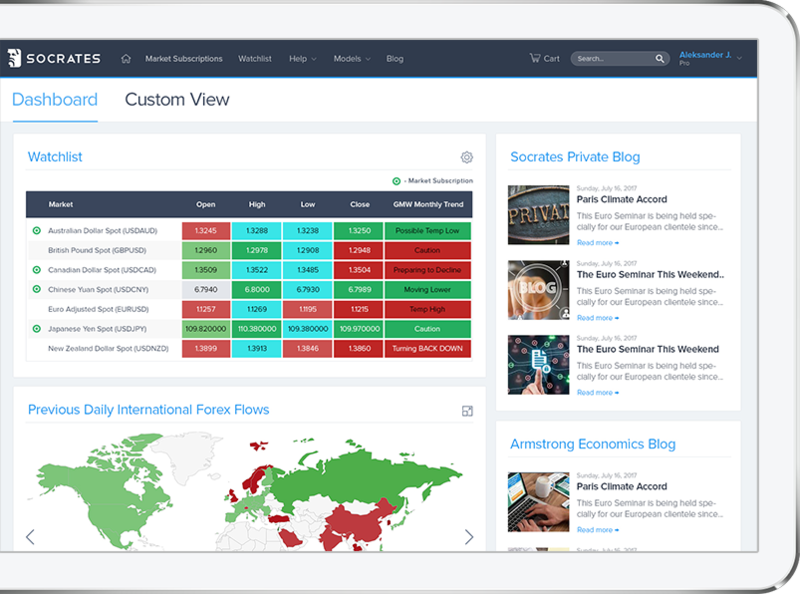 Utilizing proprietary models, artificial intelligence and extensive database, this platform is capable of identifying changes in international capital flows and concentration with indicators and analysis not found elsewhere. 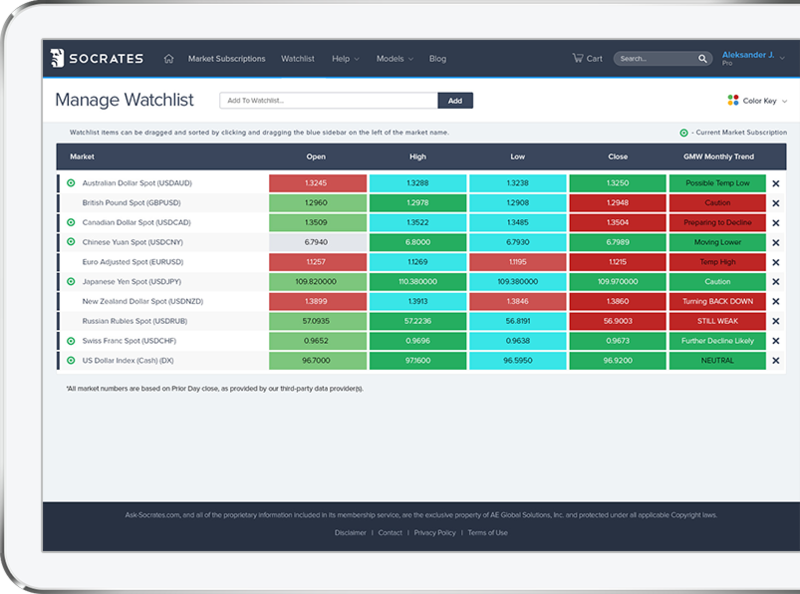 The Socrates Platform covers top indices, stocks, exchange-traded funds (ETFs), commodities, bonds, and foreign exchange / currencies from around the world (our "Covered Markets"). Each night our system integrates end-of-day data to generate insights across our entire list of Covered Markets (see full list here). Each night our artificial intelligence engine produces unique text analysis for each Covered Market. Members can unlock this by adding a recurring "Market Subscription" or a one-time "Snapshot Report" to your account. We've simplified our text analysis into three versions: Summary Analysis, Detailed Analysis and Premium Analysis. Member-defined list of Covered Markets on the Socrates Platform to keep top of mind for research. Due to the high demand from our initial launch, we have undertaken a project to update our service to accommodate our global audience (new servers, payments systems, data providers, etc). This will better enable us to release additional membership levels, offering more insights. While this won’t all take place at once (it is a big endeavor), members can still access their account. We appreciate the enthusiasm and patience of our followers while we work on these exciting updates! Ask-Socrates platform is not an individualized trading advisory service, nor is it a brokerage or money management service. 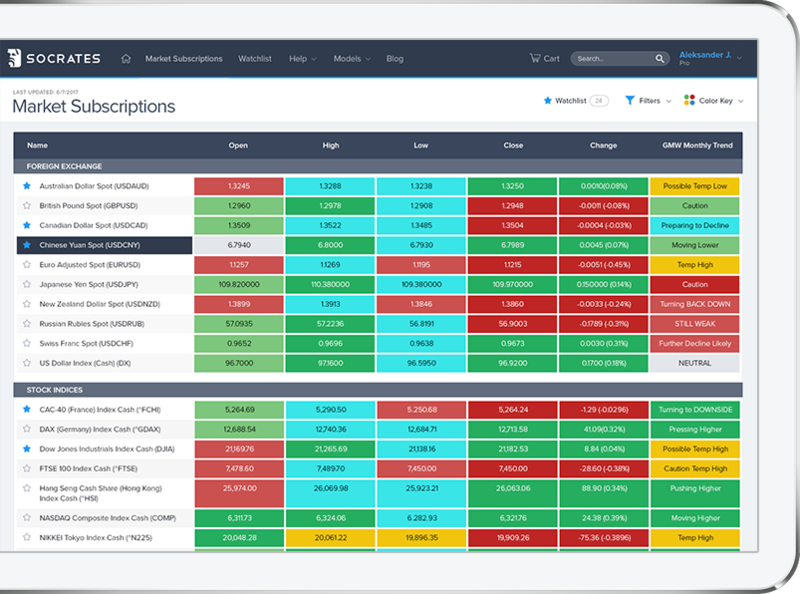 This is a simply an innovative, proprietary research and information system to help broaden perspective, intended to be a supplement to other tools and information members can use to fit their needs. To learn more, please read out Terms and Conditions of Use carefully.